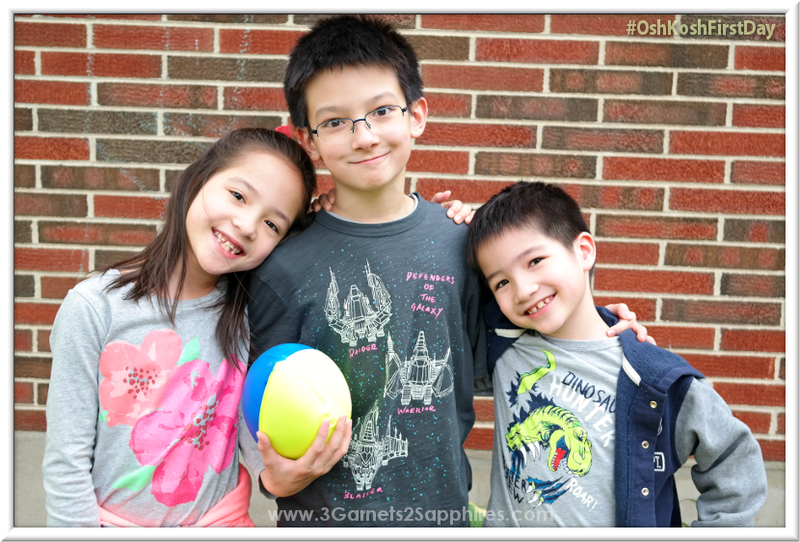 This post was written as part of a sponsored campaign for The Motherhood and their client OshKosh B'gosh, featuring back-to-school fashions for boys and girls. All opinions expressed are my own. Like with all my other shopping, I start my back-to-school shopping early. I usually have 90% of the school supplies purchased from the lists sent home on the last day of school by mid-summer. I also pick up clothing in the next size up throughout the year if I find something that's stylish for a great price. I take a quick inventory 3 to 4 weeks before school resumes to see what's missing from my 3 children's fall wardrobes. Then I make it my mission to fill in those gaps before school begins. Now that my children are 7, 7, and 10, shopping isn't as easy as it used to be. My children seemed to have developed stronger opinions about what styles and colors they want to wear. 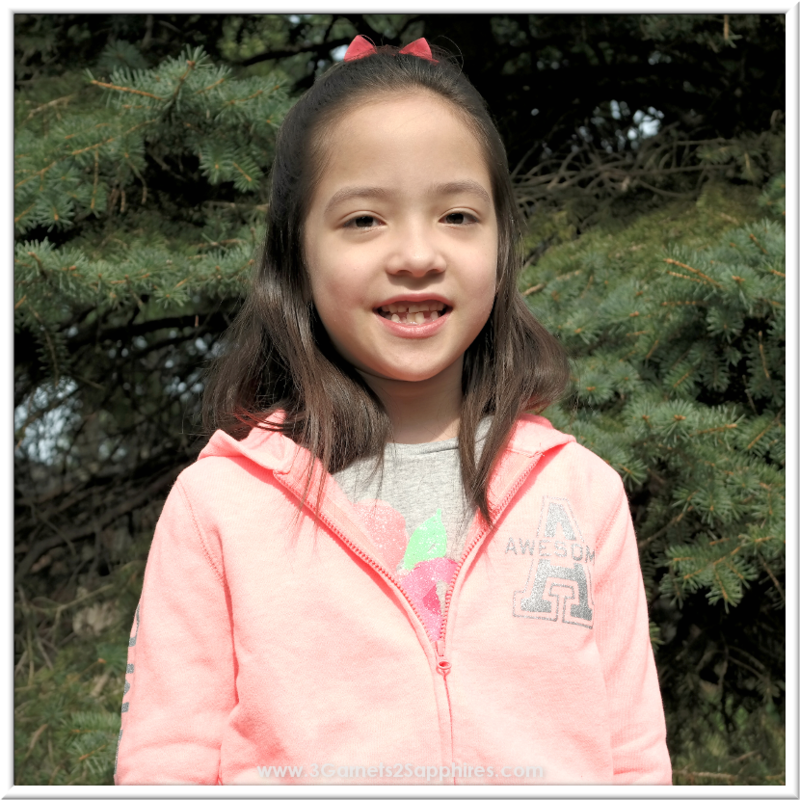 Luckily for me, OshKosh.com had more than enough on-trend and age-appropriate children's fashions to please me, my two 2nd graders, and my 5th grader. In fact, when I asked each of them to pick out one outfit each, they tried to convince me that they couldn't narrow it down, so I would just have to purchase 3 or 4 outfits . . . each. Their efforts were commendable, but I stood my ground . 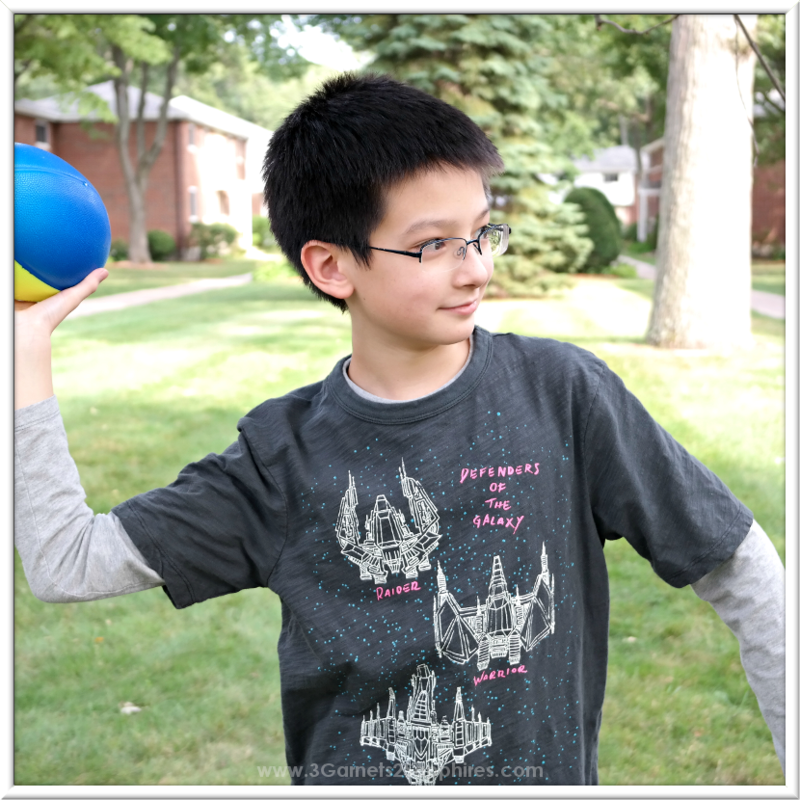 . .
Our 10 year old son lives in graphic tees and jeans. Like with many boys, comfort is almost more important than style for him. 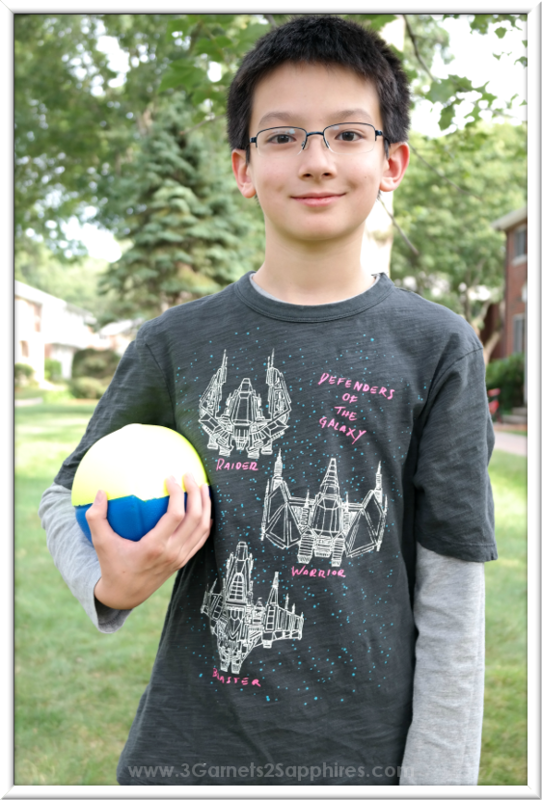 With the selection of clothes for tweens at OshKosh in sizes up to a 12, our son can have both. Here he is in the Glow-in-the-Dark Space Tee layered on top of an OshKosh Originals Graphic Tee paired with the Mellow Medium Wash OshKosh Straight Jeans. OshKosh is name synonymous with quality, especially in denim. 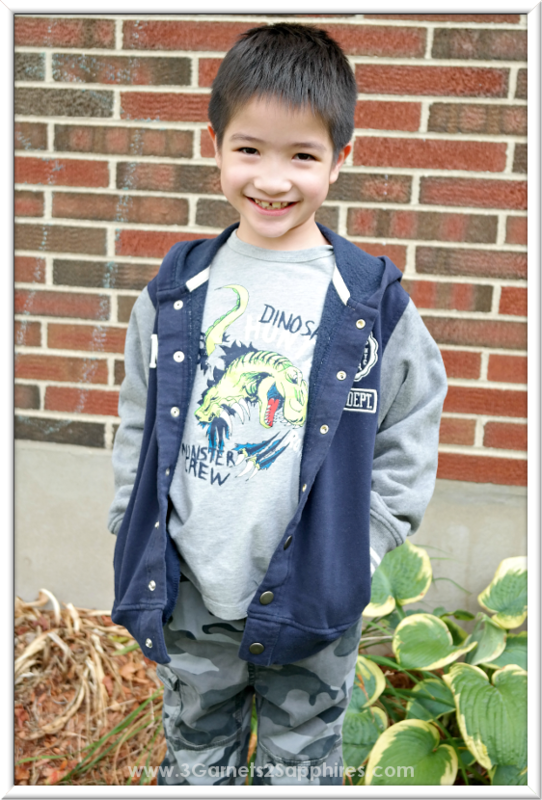 This is important to me, especially when it comes to clothing for my oldest son. Nearly everything I purchase for him will get passed down to his younger brother, so it needs to last. When it comes to clothing, our 7 year old daughter wants it all. She demands style, comfort, functionality, and . . . sparkle! Her clothes need to be cute, girly, but also playground-friendly. Our daughter wanted glitter and she found it! She fell in love immediately with this bold floral text-free OshKosh Originals sugar glitter graphic tee. When she saw the Girl Power Hoodie with the glittery text in neon coral that coordinated with the graphic tee so well, she just had to have that too. We both very much liked the inspirational, yet fun messages on these OshKosh yoga-inspired hoodies. Our daughter loves the look of denim, but prefers the comfort of leggings. It was no surprise to me when she opted for the Shoreline Blue OshKosh Jeggings. Finally, she always likes to finish off her outfits with a coordinating hair accessory or some type of jewelry (or both). She ended up putting one of the bows from the 3-Pack Sparkle Bow Pony Holders in her hair and used the other two for bracelets! Smart, huh? Our 7 year old son is extremely easy going when it comes to his clothes. As long as it's comfortable and fits, he's good with it. That being said, when he is asked to choose his own clothes, he definitely has his own style. In fact, his picks for his outfit from OshKosh were right in line with the top back-to-school trends for boys this season . . . The first item our son chose was a pair of Camo 5-Pocket Pull-On Cargo Pants. How did he know camouflage is a major trend this season? His whole outfit revolved around these must-have pants. Something else we're seeing a lot of is dino-themed graphic tees. 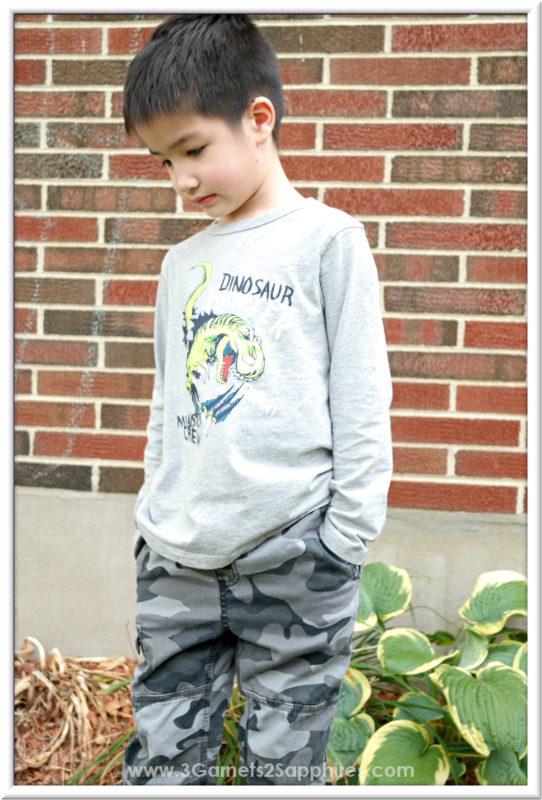 Well, our little man happened to pick the OshKosh Originals Dinosaur Hunter Graphic Tee to go with his camo bottoms. His next pick truly surprised me. I predicted that our little boy would have opted for a hoodie to go with his outfit, but he chose the Fleece Letter Jacket. Our son loves this soft comfy jacket so much that he puts it on first thing when he gets up in the morning, even if it's 75 degrees outside! Will your children be trendsetters this year at school? Well, there are more ways than one to lead by example. Your children could participate in the B'gosh Jeanius Campaign to help give local children a 'Leg Up!' this back-to-school season . . .
How can your family get involved? Simply make a donation in the form of a pair of OshKosh blue jeans or a cash donation of $1, $3, $5, or $10 at your local OshKosh store. Denim donations will be given to children in need in yours or a nearby community via K.I.D.S./Fashion Delivers. Cash donations will go to local schools in need who are signed up with DonorsChoose.org. When your child tells his or her friends how they gave back to their community, maybe they'll inspire someone else to do the same! Encourage your child to be a trendsetter this year! Will you be heading to OshKosh to do some back-to-school shopping? 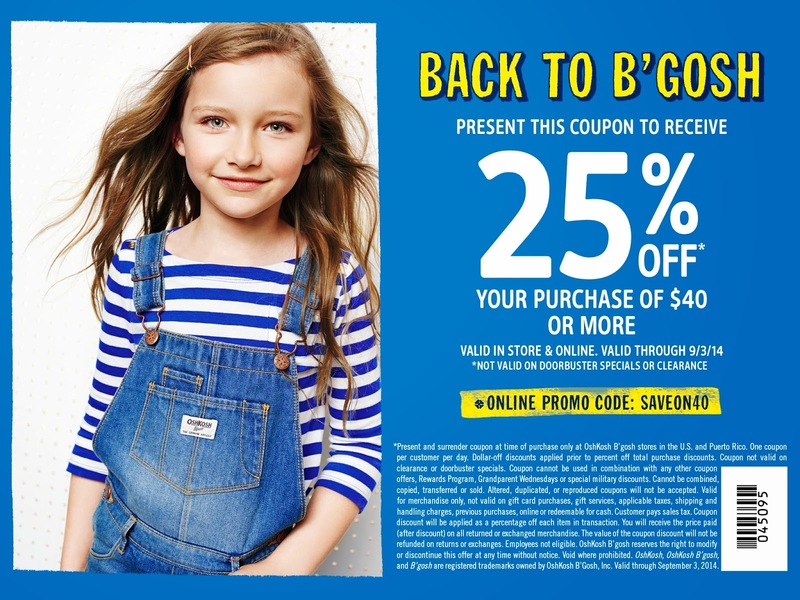 Be sure to print this OshKosh coupon to save 25% off your purchase of $40 or more through 9/13/14. Shopping online? You can save with OshKosh promo code SAVEON40 at OshKosh.com. TO PRINT: Make sure your printer is on and ready to to go. Click on the image to enlarge. Then right-click on the enlarged image and select print. Use your browsers back arrow to return to this page. 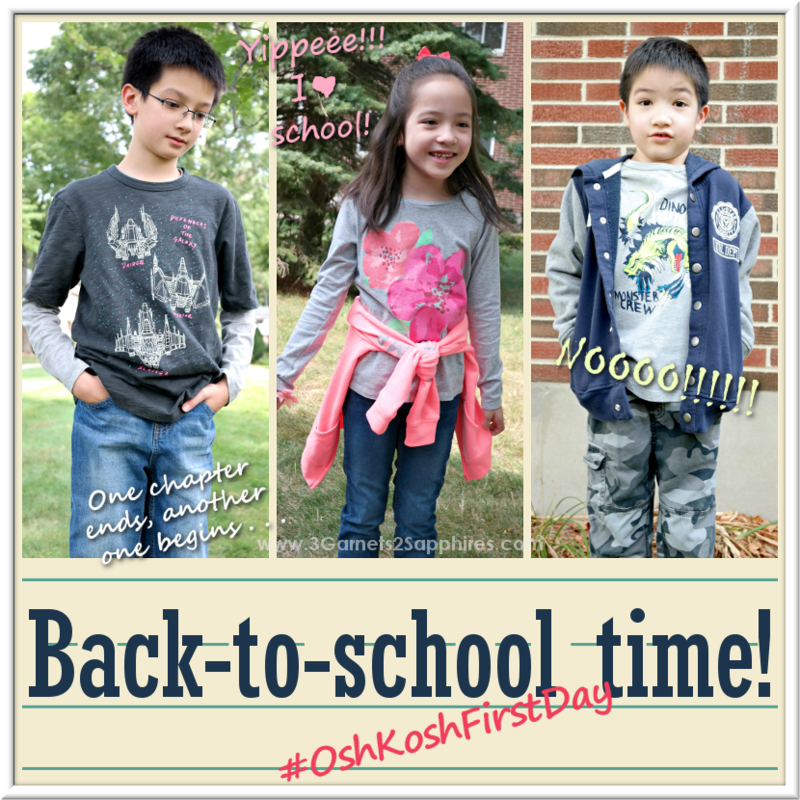 Checkout the cool #OshKoshFirstDay back-to-school ideas below . . . 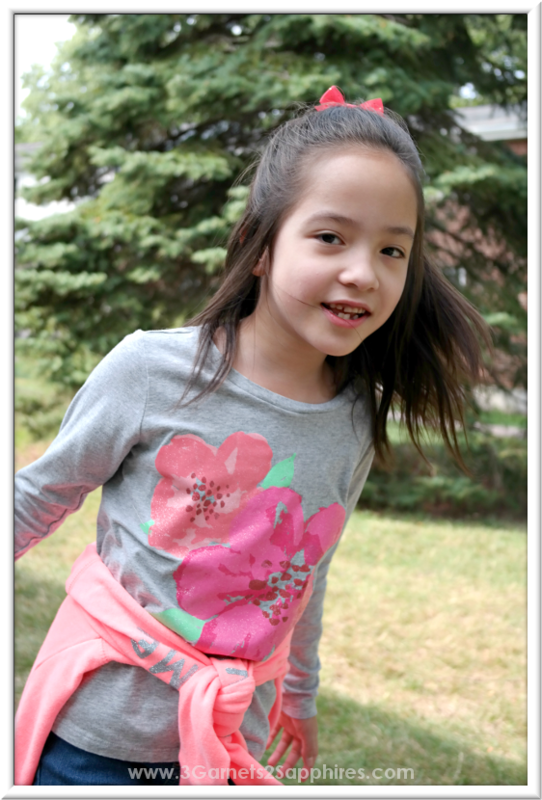 Follow Karen Coutu's board Back-to-School with Oshkosh & More! on Pinterest.